Hi! Angie here with a card featuring sweet BFF Avery Girl! She is so pretty, don’t you think? It’s spring break for my daughter so we spent one of the days shopping for a graduation dress. We found a dress very similar to Avery’s dress only in all white as per school graduation dress code rules. Avery makes me think of my sweet girl. One thing I love about the Picket Fence Girls is their size. I can really have fun adding eye shadow and a touch of blush! It’s kind of like playing paper dolls only they won’t get bent and their accessories won’t fall off! Remember the little tabs that were supposed to keep the clothes on? Such frustration. Anyway, I love being able to add fun touches on the Girls and every time I stamp them I can dress them differently! 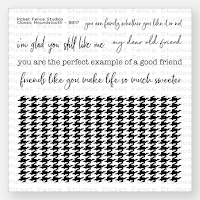 I love being able to create my own borders with stamps like this one with the Classic Houndstooth pattern. Being able to stamp my own patterns means I never run out of that perfect piece of designer paper! 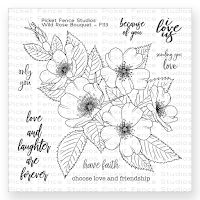 As a finishing touch, I stamped the Wild Rose Bouquet then I colored and fussy cut just one of the blooms and added it to the sentiment banner for a fun pop of color.